2018 Is The Year Democrats Got Comfortable Talking Health Care Again In their closing arguments to voters, Democrats are attacking Republicans for trying to roll back popular Obamacare provisions. Republicans are shooting back with a focus on pre-existing conditions. 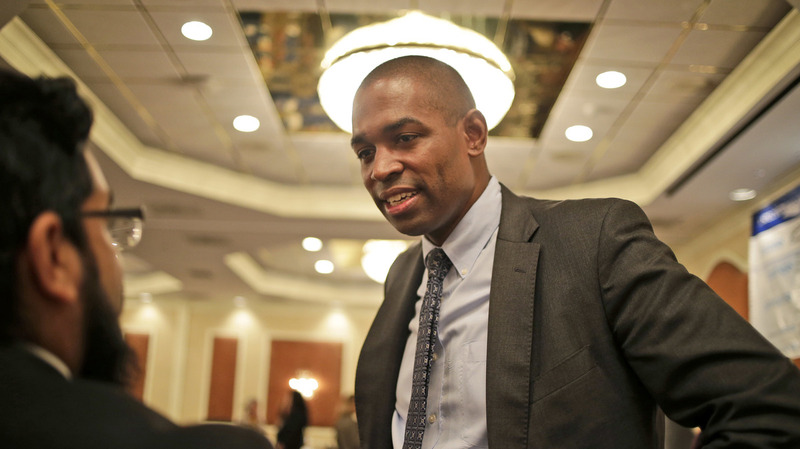 Antonio Delgado is one of many Democrats making health care the centerpiece of their campaigns. Since the start of October, New York Democrat Antonio Delgado has posted 14 ads on YouTube. Some show him out greeting voters. Others are attack ads on his opponent, Republican Rep. John Faso. But the overwhelming majority — all but one of the ads — mention health care. Delgado is in a tight race in New York's 19th Congressional District. And his strategy is one Democrats nationwide have embraced. The party has been hammering on health care relentlessly. In fact, more than half of pro-Democratic TV ads in the home stretch to Election Day have mentioned health care, compared to around one-third of Republican ads, according to the Wesleyan Media Project. The prevalence of health care in this year's ads sets 2018 apart, according to Erika Franklin Fowler, co-director of the Wesleyan Media Project. "It's very unusual," she said. "I think if we look at this cycle in comparison to the last over the last decade, we're seeing many, many, many more times the discussion of health care than we have." That's a big change from the 2010 and 2014 midterms in particular, when Republicans regularly slammed Obamacare, former President Obama's 2010 signature legislative achievement which is also called the Affordable Care Act. Democratic ads, meanwhile, barely touched the topic, according to Wesleyan's data. But since 2016, Republicans have tried and failed to repeal the Affordable Care Act and the law has gained popularity. According to data compiled by the nonpartisan Kaiser Family Foundation, Americans have either been evenly divided or had a net-favorable view of Obamacare since January 2017. That's after years in which Americans often had a net-unfavorable view of it. "Democrats have a very clear advantage on health care, and not only that, it's one of the top issues that voters say matter to them," said Democratic pollster Margie Omero. "It's something that we hear in focus groups all the time." Indeed, a recent poll from NBC News and the Wall Street Journal finds that voters give Democrats an 18-point advantage on the question of which party handles health care better. All of this has emboldened Democrats to attack the GOP. But in recent weeks, Republicans have ramped up their own messaging. Among the new ads that popped up in recent weeks: one from Republican John Faso, whom Delgado is trying to unseat. The ad features Faso's wife, a cancer survivor, saying he voted to guarantee coverage for people with pre-existing conditions. This is one of a recent crop of ads where GOP candidates promise to protect people with pre-existing conditions. Similar ads have come from California Rep. Dana Rohrabacher, Nevada Sen. Dean Heller and Wisconsin Gov. Scott Walker. President Trump has been saying the same thing. Wednesday, Trump tweeted that "Republicans will totally protect people with Pre-Existing Conditions." But to be clear: the Republican Obamacare repeal bill — cited in Faso's ad as an example of how he voted to protect sick people — would have made it harder for many with pre-existing conditions to get coverage, according to the Kaiser Family Foundation's Larry Levitt. "Insurers would have still had to guarantee insurance to people with pre-existing conditions," he said. "But people who were uninsured and had a pre-existing condition they might have faced prohibitively high premiums, which would have put coverage effectively out of reach." That's not the only way the GOP repeal bill could have hurt people with pre-existing conditions. "States would have also been able to waive the ACA benefit requirements," he added. "So if you have cancer and you need an expensive drug the fact that you can get insurance but not get coverage for that drug, isn't going to help you very much." On top of all that, the Trump administration will not defend against a lawsuit from 20 state attorneys general that seeks to declare Obamacare unconstitutional — meaning it could potentially overturn the law's pre-existing condition protections. In the face of Democratic attacks and with a tough election approaching — Republicans have made some moves on the topic of pre-existing conditions to counter Democrats. One early September law, the "Pre-existing Conditions Protection Act," would have still allowed insurance companies to charge ultra-high premiums for people with pre-existing conditions, according to experts interviewed by McClatchy at the time. Another measure "expressing the sense...that protections for individuals with pre-existing conditions should be retained in law" also got some Republican support....but it wouldn't have had any real effect. Obamacare's protections for people with pre-existing conditions are highly popular: According to a September poll from Kaiser, even a majority of Republicans supported keeping those protections. However, Levitt points out a flip side to the policy. "When the ACA guaranteed insurance to people with pre-existing conditions premiums did go up especially for people who are healthy," he said. This has long been part of the Republican argument: that Obamacare raised premiums for too many people, and furthermore forced people to get insurance they didn't want. And while some Republicans are playing defense — Iowa Rep. David Young, for example, touts one of his votes for a fund that would have gone toward people with pre-existing conditions — getting too defensive isn't a great strategy, says one operative. "There's a truism in politics that if you're explaining you're losing," said Republican strategist Michael Steel. It's not that Republicans have been dodging health care this year. Rather, they have other lines of attack. Perhaps the biggest: single-payer health care, often known as "Medicare for all." Around half of Democratic House candidates back the policy this year, according to USA Today. And while it might be popular among the Democratic base, distaste for it motivates many in the Republican base. "I think Republicans feel that the increasing radicalization of the Democratic Party, that the growing support for Medicare for all — without a realistic plan to pay for it — also provides an opportunity when talking to a lot of voters who are trying to make up their minds right now," Steel said. Estimates of the cost of Medicare for all vary widely, as in one recent study that found it could cost up to $32 trillion or save up to $2 trillion over a decade. While these arguments about Medicare for all and preexisting conditions are being used to motivate voters to turn out on Election Day, the reality is that the election probably won't do much to settle the debate.